Welcome to ColorMe3D. Our filament has been created with years of 3D engineering experience. Our colors and creation of 3D usable parts has been in use for several years. Our filament products works with all printers using the standard 1.75 mm diameter in use today. Our team is always creating new products and we stress test everything we produce. We produce all of our filament with the dimensional accuracy of +/- 0.05mm for the 1.75 product lines. PLA is in use in many products you see everyday. It can handle everyday usage and handle the outside elements very well. We see PLA as a full production material for many parts in use today. Design Your Ideas & Memorable Moments w/o Relying On Spending A Fortune? This Is It! The Possibilities Are Literally Endless; What Will YOU Do With It?" Want to capture that idea, design a part, What do you want to create NEXT? Are you Ready With Our Filament for coolest designs & colors. You'll love our quality, prices, and colors ColorMe3D has to offer. It's made of professional grade PLA material -nothing else compares. Give it a try, it's guaranteed for a reason. Order now, supply is limited. The designs you'll create will far exceed the price you're paying; we mean it. Do compare by price and quality! Order yours now. Simply Click "Add to Cart" to claim the best value 3D filament...and reap the benefits of capturing those fun, wild designs you'll never forget...100% risk free! From the manufacturer ColorMe3D (Made in The USA): Our 3D filament sell out quickly and are difficult to predict the stock of. Media stories online can cause demand to spike sporadically. Place your order before they're sold out. LOVE OUR GREAT 3D Purple Haze PLA FILAMENT - Think about all the fun creating designs with our professional filament Try it now, decide later. it's that good. 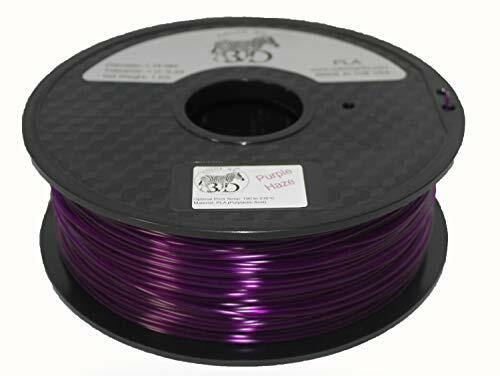 You'll wish you had ordered ColorMe3D purple haze filament before. DON'T BUY 3D FILAMENT ONLINE OR IN A STORE WITHOUT READING THIS FIRST -- Other 3D filaments may not have that perfected tolerence (1.75+-0.05 mm) to work correctly in your machine. Ours Works That Well. If you have any questions about this product by Color Me 3D, contact us by completing and submitting the form below. If you are looking for a specif part number, please include it with your message.